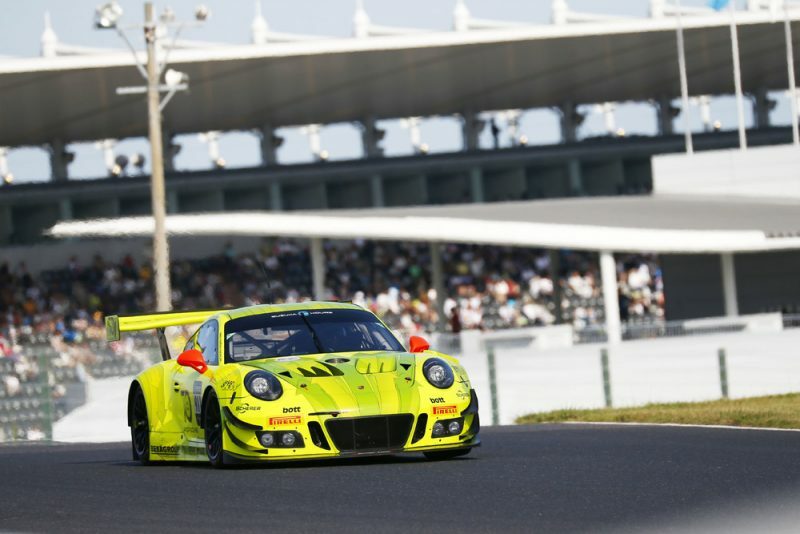 The Porsche 911 GT3 R fielded by the Manthey-Racing team takes up the Suzuka 10 Hours from the third grid row. The Porsche works drivers Romain Dumas, Frédéric Makowiecki (both France) and Dirk Werner (Germany) planted the number 911 customer vehicle on P6 for round three of the Intercontinental GT Challenge in Japan. Thirty-seven-year-old Makowiecki set a lap time of 2:02.425 minutes on Saturday at the final qualifying on the Suzuka Circuit. The Porsche cars fielded by Craft-Bamboo Racing and D’station Racing also qualified in the top twenty: Kévin Estre posted the 17th quickest qualifying time in the ca. 500 hp customer sport racer campaigned by the Craft-Bamboo team. The Frenchman shares the cockpit of the number 991 car this weekend with his works driver teammate Laurens Vanthoor (Belgium) and Porsche Young Professional Mathieu Jaminet (France). Earl Bamber (New Zealand) planted the D’station car on P19. His teammates in Suzuka are Sven Müller (Germany) and Tomonobu Fujii from Japan. Two additional Porsche 911 GT3 R racers tackle the Pro-Am class for professionals and amateurs this weekend. The second entry of the Asian team D’station Racing with drivers Satoshi Hoshino, Tsubasa Kondo and Jono Lester concluded the qualifying on position 32. Tim Pappas, Jeroen Bleekemolen and Marc Miller share driving duties in the #54 car of Black Swan Racing. The trio took the 33rd grid spot. Like Manthey-Racing, the squad from the USA contests all four rounds of this year’s Intercontinental GT Challenge. The four-part qualifying on the 5.807-kilometre Grand Prix circuit took place in sunshine and a humid 34 degrees Celsius. Per vehicle, every driver had to complete one of the first three segments. The resulting average lap time determined entry into the top twenty qualifying. In the fourth and final session, only one driver per vehicle was permitted to go back out on the track: from this, the fastest lap counted. The Suzuka 10 Hours takes off on Sunday at 10.00 hrs local time (03.00 hrs CEST). In Europe, the race can be seen after the finish on the Intercontinental GT Challenge website www.intercontinentalgtchallenge.com.